Profit-pinched newspapers trying to save money by cutting back on the newsprint they consume will be hammered by a 23% increase in the cost of whatever paper they do buy this year, fears one analyst. If Paul Ginocchio of Deutsche Bank is right, newspapers that already have trimmed page sizes, eliminated stock tables and scrapped op-ed sections will have no alternative but to pay the sharply higher price for newsprint – unless they can find even more ways to shrink their already shrunken newsholes. Newsprint could rise to an average price of $700 per ton by the end of this year from an estimated $570 at the end of 2007, says Paul, citing the aggressive efforts by paper mills to throttle back production in response to flagging demand in the last few years from newspapers and other legacy print publishers. As you can see from the chart below, newsprint was uncharacteristically cheap last year, because the mills couldn’t reduce production fast enough to keep pace with constricting publisher demand. The law of supply and demand, which benefited newspapers last year, will assert itself with a fresh vengeance in 2008, because the mills, which now have scaled back their capacity, are poised to start ratcheting up prices on the limited amount of product available to the market. “We expect newsprint to rise sharply in the first half of 2008, continue to rise – though more slowly in the back half of the year – and then start to plateau into 2009 as more [idled paper-making] machines come back online due to the higher price,” says Paul. Newsprint historically has represented about 20% of a newspaper’s operating expenses, so a hefty increase in this fundamental commodity will further decay margins already challenged by declining sales and other rising operating costs. As discussed here, newsprint and headcount are two of the comparatively flexible expense items that publishers can crunch in times, like these, when profits are constrained. Even crediting publishers with some ability to further reduce their print consumption, Paul believes the looming spike in paper prices will play havoc with the earnings of the publicly traded companies he covers. Consequently, he is dropping his estimate of the 2008 per-share earnings of McClatchy by -11.2% to $1.27, Media General by -9% to $1.62, New York Times Co. by -6.3% to $1.34, Gannett by -4% to $4.35, Lee Enterprises by -4% to $1.43, Belo by -3.4% to $1.12, Scripps by -1.5% to $2.57 and Washington Post Co. by -0.9% to $36.24. 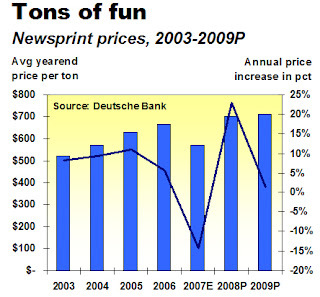 Soaring newsprint prices are only one of the many factors that will pressure profits for newspapers this year. With nearly 11½ months to go, we are sure to pass this way again. There's no doubt that newsprint pressures are going to add to the financial pressures of publishers large and small. As someone who contracts for presstime and choking on my 2008 price schedule, I can testify to that firsthand. But rather than dwell on the obstacle, let's look at the opportunity. Rather than lopping off pages and page size (smaller broadsheets, trimming page count) this is a real opportunity to re-evaluate the content that's going into the product. For those who haven't taken a look at the CSM for a while, I recommend laying you hands on any given week's worth of issues. It really is an excellent model for where we can go to survive -- and thrive -- in today's volatile media environment. /gratuitous, non-compensated plug for the CSM. It amazes me we're still printing news on paper in 2008. I can't wait for us to get sure enough of our footing on the web that we can forget all about the price of paper (and distribution/delivery, for that matter). You might want to check out this media release from Greenpeace today. For those who don't know, the larget newsprint manufacturer in North America, AbitibiBowater, has been embroiled in controversy in Canada. They are logging the last intact areas of the Boreal Forest which just happens to be the largest storehouse of carbon on the planet. Turn this forest into the new york times probably isn't the best idea. Maybe they should practice more sustainable forestry and focus their operations on previously disturbed areas?